Can we talk about how it just keeps snowing here in Colorado? Yeah, I’m totally that annoying person that doesn’t talk about certain things or won’t do certain things because I’m afraid of jinxing something. My brain. It does funny things. But anyway, it snowed a ton (somewhere between 2 and 32 inches – thanks weather guy!) and like I mentioned yesterday, we went sledding and then we went sledding some more and then we threw snowballs at each other. Because who knows when we’ll live in a snowy place again! It’s got corn and chicken and potatoes. And there may even be some bacon in there! In a large pot, cook bacon until crisp. Remove with a slotted spoon, leaving the fat. Save the bacon for serving! Put green onions and sliced potatoes in pot with bacon fat and cook until the green onions have softened, just a minute or two. Sprinkle flour over top and stir for another minute. Pour in milk, chicken broth, Old Bay, parsley, and cayenne pepper. Bring to a boil, stirring occasionally. Lower to a simmer and cook until potatoes have softened, about 15 minutes. Add both cans of corn and the chicken, continue cooking until everything is heated through. 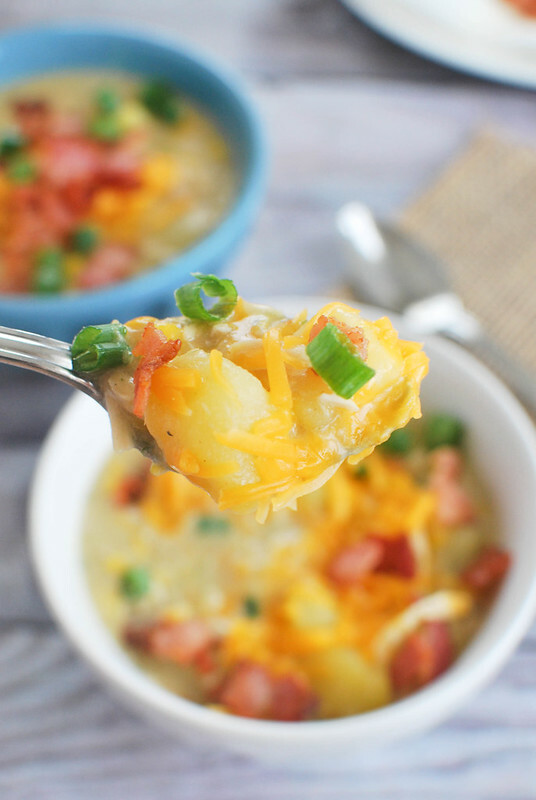 Serve immediately with bacon, cheddar cheese, and green onions sprinkled on top. 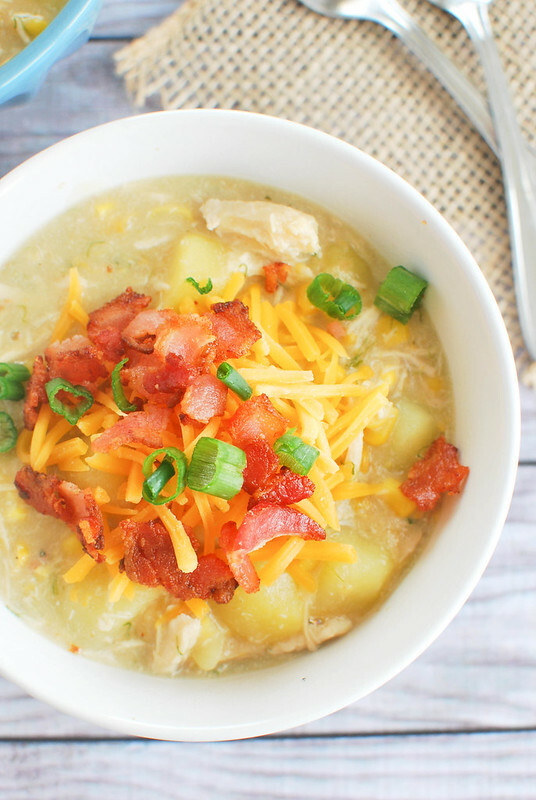 16 Responses to "Corn and Chicken Chowder"
Can relate to all the snow here in Boston! Great soup weather though, and this one looks good. We haven’t even had enough snow this year for the kids to go sledding and I live in Minnesota. It’s been freeezzing here though, so this soup is the perfect to warm up! Perfect after a day in the snow! Living in Michigan I can relate to lots of snow, however, you have the gorgeous mountains nearby :) Oh how I would LOVE to live in Colorado! It is frigidly cold here in VA this morning; just one look at this yummy soup makes me feel a bit warmer already! Looks so good! I love chowders of all kinds and this one looks particularly easy and delicious. And of course, with bacon, it can’t miss! There is nothing like a soup that uses up those bits of chicken that I often have leftover after serving roasted chicken. Oh we are huge soup eaters! This winter Ohio has had a ton of snow too so I’ve been making soup at least once a week, this is going on the menu this week! I’m a soup-a-holic, so I can’t understand the “I never knew I liked soup”, but WOW, did you make a fantastic one! I have been craving soup which rarely happens because I don’t particularly like soup. But my tastes have been changing which really pisses me off because I don’t need to like more food. I need to not like anything. #bikiniseason This looks really good though with lots of potatoes that I love. This looks like such a comforting soup! Love the addition of chicken. I love chowder like this! My Mama has always added these yummy ingredients to her chowder. 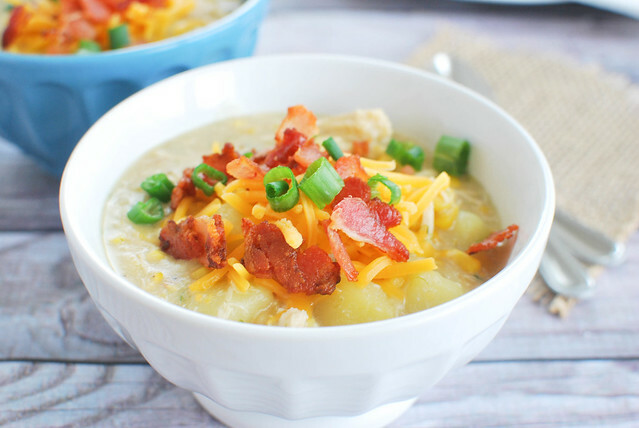 But I agree with you – the chicken, bacon, potatoes makes this so substantial -more so than many soups. So Delicious – and your pictures make me hungry! This sounds amazing on a cold, dreary day! I love soup year round but especially this time of year. 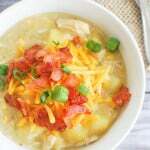 Chicken and corn chowder sounds fantastic–filling and soul satisfying. Will definitely try it. I’m actually a little jealous of your snow and sledding!! Before we left for Australia it had snowed maybe twice? And just a little bit. Not that I love snow, but the snow sports and sledding are fun! And of course snowball fights! But the best thing about the cold are the warm comforting soups like this one – delicious!! And such beautiful pictures! I’m so jealous of your snow! We’ve just had lots of cold. Love chowder like this on a chilly evening!